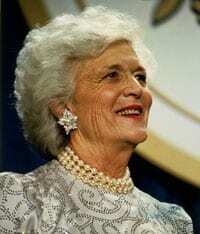 Former First Lady Barbara Bush passed away on April 17. Mrs. Bush was a strong supporter of higher educational opportunities for all students, and exhibited her support by serving on the board of the Morehouse School of Medicine (one of only three HBCUs that have a medical school) during the founding years of the institution. [Morehouse College is a UNCF-member institution.] Her association with the medical school allowed for landmark changes on that campus and helped sow the seeds for important and ongoing federal programs such as the “Strengthening Historically Black Graduate Institutions” (HBGI) Program at the Department of Education. Mrs. Bush worked closely with the institution’s founding dean and first president, The Honorable Louis W. Sullivan, M.D. Sullivan is a Morehouse College graduate and President Emeritus of the Morehouse School of Medicine. He also served with distinction under President George H.W. Bush as the Secretary of the Department of Health and Human Services from 1989 -1993–the first “Morehouse Man” to serve in a U.S. president’s Cabinet. Sullivan issued the following statement in remembrance of Mrs. Bush’s support of Morehouse and HBCUs. UNCF joins him in expressing appreciation for her work and condolences to the Bush family. “Barbara Bush was a great humanitarian and a “larger than life spirit” who contributed much to enhance and enrich the lives of Americans and people around the world. “I first met Barbara when we both accompanied then-Vice President George H.W. Bush as part of his delegation during a two-week trip to Sub Sahara Africa in November1982. “While Vice President Bush was meeting with Heads of State in these newly-independent countries, Barbara was interacting with adult literacy groups—mostly women—stressing the life-changing effect of learning to read. I was impressed with her commitment to increasing adult literacy throughout the world. That commitment continued throughout her life. “She also spoke at the dedication of Belvedere College, a new institution in Harare, Zimbabwe, built with funds from the U.S. Agency for International Development. The college was designed to provide education and training in agriculture, carpentry and bricklaying, in addition to academic offerings, to assist the citizens of Zimbabwe. “Although she denied it, I always suspected she joined with others to encourage her husband to appoint me as U.S. Secretary of Health and Human Services in his administration, where we worked to improve the health of Americans by decreasing tobacco use, increasing use of seat belts in our vehicles, creating at NIH the office for Research on Minority Health (which has grown into the National Institute for Minority Health and Health Disparities). We worked to increase race and gender diversity among the leaders in the department, including the first female director of NIH (Dr. Bernadine Healey), the first woman and first minority Surgeon General of the U.S. Public Health Service (Dr. Antonio Novello), the first African American Commissioner of the Social Security Administration (Gwendolyn King) and the first African American Administrator of the Health Care Financing Administration (now the Center for Medicare and Medicaid Services, or CMS: William Toby). “From 1983 to 1989, Barbara was a committed trustee of Atlanta’s Morehouse School of Medicine, the only four-year predominantly African American medical school founded in the United States in the 20th century. She wrote the foreword to The Morehouse Mystique, the history of the medical school, in which she stated, “Morehouse School of Medicine has made a profound difference in the lives of countless people.” An endowment gift from a Texas foundation established the George H.W. and Barbara P. Bush Professor of Neuroscience at MSM.